The Colorado Initiative for Model Practices in Augmentative and Alternative Communication and Technologies (IMPAACT) is an initiative that focuses on improving educational services and outcomes for students with Complex Communication Needs (CCN). The goal of this project is to document and disseminate best practices in the field of AAC and Special Education. Professional development courses for the IMPAACT program started with research, best practices, and application of Core Vocabulary. The recording of this web-based training can be found on the SWAAAC YouTube channel. In this video clip, the Speech-Language Pathologist is using components of the Story Grammar Marker Program and Lego Story Starter kit to facilitate narrative language skills and tell a personal story. Watch as the therapist models language and meta-linguistic narrative skills on the student's device. The narrative produced with the AAC device was then expanded into a written language activity. Story Grammar Marker, Lego StoryTales, and StoryStarter kits are available through the SWAAAC loan library. The third training course targeted the application of descriptive teaching strategies. 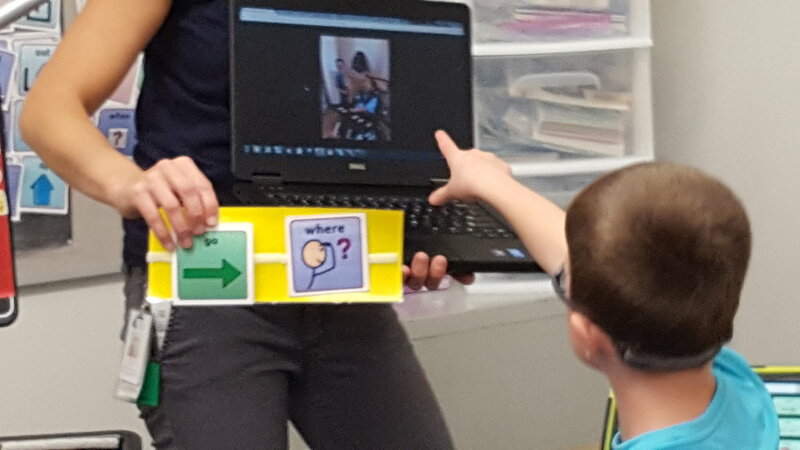 Participants learned how to frame academic content such that students using AAC systems are able to demonstrate what they know using their core vocabulary. The recording of this web-based training can be found on the SWAAAC YouTube channel. In this video clip the Occupational Therapist has inside information about the student's weekend activities. When he does not respond as expected, the therapist presumes competence by accepting his response and co-constructing meaning from his message.